Rivers are one of the most basic natural resources and are the backbone of human civilisation. It is because of rivers that for centuries, the human race has not only survived but also grown and prospered. However the modern discourse of 'development' looks at rivers as only commodities to be exploited and thus our great rivers are dying! It's our responsibility to save them. For that we need strict laws, check mismanagement of water, clean rivers, practice afforestation, but most importantly, change the careless attitude of communities towards rivers. The ITV Foundation will be taking a step forward by organising various cleanliness drives for clean rivers, embankments, rivulets and canals. The Foundation will conduct a camp on Ganga ghat in Allahabad in the first week of December before the Ardh Kumbh Mela. There will also be awareness campaigns for environmental sanitation. Arrangements will be made for gloves, dustbins and trucks to carry away the dirt from the banks by volunteers. The Foundation will be canvassing for sponsors to donate toilets and baths for the ghats and will start with online and offline registration of volunteers for the drive soon. Severe flooding affected Kerala state in India due to unusually high rainfall during the monsoon season. It is Kerala's worst floods in nearly a century, over 350 people died within a fortnight, while at least 661,000 were displaced and all 14 districts of the state, were placed on high alert. In the week ending August 15, Kerala received 3 times the amount of rain it normally gets at this time of the year. 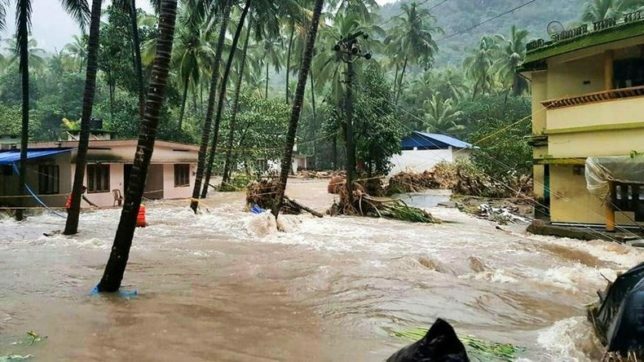 Two districts alone, Idukki and Wayanad, received almost as much rain as the entire state expects to get during this time. One of the major factor is the failure of ecological sensitive western- ghats to respect the nature and forests which has resulted in this calamity. It’s high time that we protect our rivers, forests and catchment areas in places which are highly prone to disasters like Uttarakhand and Kerala. Apart from that cleanliness is extremely important and to avoid such disastrous situations the government should take steps in order to completely Ban illegal mining and construction. iTV foundation the CSR Wing of iTV network will support the Kerala flood victims, the foundation will contribute to Kerala CM Relief fund. Please join us in this great cause to help and support these victims by directly contributing to the Kerala CM Relief fund because your small contribution can save a life! Please find the direct link for donation. Join us and Help the victims OF Kerala flood to live a better tomorrow.